Are you thinking about buying a helicopter? Selling one? Funding a purchase or lease? As in economics, there are both micro and macro elements critical to its value. Let's define micro elements as those which are inherent in the helicopter itself. These are the things that a buyer looks for: the status of the components as a percentage used, the existence of power-by-the-hour contracts on the engine(s) or drivetrain, the configuration and installed equipment, the avionics, the country of registry, and the quality of the operator who has been using it. Arguably the most famous definition of a helicopter is "an assembly of forty thousand loose pieces, flying more or less in formation." Given a specific helicopter, the most important micro element of value is the components' Time Since Overhaul (TSO) or Time Since New (TSN). This includes the dynamic components such as engines, transmissions, swashplate, main- and tail-rotor blades, drive shafts, and flight controls; and we'll throw in the major airframe inspection as well. "TSO" is used for components which must be periodically overhauled and then returned to service. "TSN" is used for components which must be removed and replaced with new or serviceable components at specific intervals. The second are often called "life-limited" components and the first "rotables." Most serial-numbered components are given a finite amount of flight time before they must be removed. The percentage of flight time used is the primary determinant of a helicopter's value relative to the resale market. 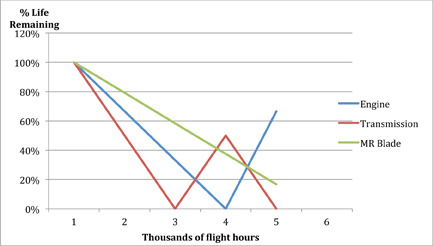 More flight time used = lower value; less flight time used = higher value. However, when these parts time-expire, they can be replaced or overhauled, which raises the helicopter's value by approximately the cost of the overhaul or of the replacement part. As you can see from the chart above, not every component depreciates over the same amount of flight time. A series of formals is used to determine the average of all the components' percentages used at any point during its life, allowing the helicopter to be accurately measured against comparable sales, offerings, and pending contracts. A Power by the Hour (PBH) contract is essentially a prepaid maintenance agreement in which the operator sends the manufacturer a fixed hourly payment and the manufacturer provides a freshly overhauled replacement part for every component under the contract term that comes to its life limit (or fails). The PBH-covered parts and components are therefore considered to always be guaranteed to be either actually in, or to be qualified for restoration to, a "zero" or "low" time service life condition. They each retain a high dollar value, regardless of their actual service life status, by virtue of remaining in "like new" condition as a result of the paid-up PBH program. Because PBH includes scheduled maintenance, it is far more than an insurance contract, and carries far more weight when valuing the helicopter. Installed equipment and avionics values are unique to each helicopter. Those items that translate well across multiple usages like air ambulance, offshore oil support, and personal use, or those that improve the performance of the helicopter, are those that supplement the helicopter's value the most. Three examples: 1) the Carson Helicopters composite main rotor blades for the Sikorsky S-61 can increase the value of the helicopter by more than the cost of the blades. 2) The Garmin 430 GPS is the most popular navigation aid in a helicopter's cockpit across all models and all usages, and correspondingly adds more value than smaller or less popular models, and an equal amount to larger, more expensive units. 3) A Restricted Category certificate of registration will reduce the value of the helicopter except in very specialized models and usages. A financier will want to know the country in which the operator will be operating. Some countries carry inherently higher risk, such as those which have been known to exercise eminent domain under questionable circumstances on assets with liens perfected by someone else. Higher risk causes the financier to charge accordingly higher rates. Countries which are signatories to the Cape Town Convention (properly known as The Convention on International Interests in Mobile Equipment and Aircraft Protocol) offer the lender better remedies for default conditions, among other improvements in perfecting their interests. Buyers and financiers alike want to know the quality of the previous operator before investing in a helicopter. Their predominant interest obviously lies in the maintenance of the helicopter, since that directly impacts the helicopter's value in terms of the status of the components' TSOs and TSNs. Because of the chain of liability, buyers and sellers will also want to know whether there are any pending or contingent charges, liens, or litigation against the previous owner and/or operator.